THE EFFECT: A deck of cards is fanned out and shown to be all different. The deck is handed to a spectator who thoroughly shuffles the cards, cuts the deck and looks at the card he cut to, and then reshuffles the deck. You are then able to tell the spectator the identity of the card he was thinking of. Al Koran was a brilliant mentalist. He passed away in 1972 but many of his routines and tricks live on in the performances of magicians today. The Koran Deck was one of the features of his act. 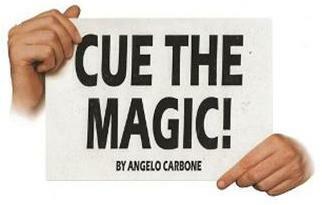 It has baffled audiences for many years and is as near to mind reading as you can get! "Experience has shown me how little known this type of forcing deck is, even among well-versed magicians. I have had the great pleasure of fooling a number of professional and technically accomplished conjurers with my routines using the Bagshawe Deck. This is one further reason, added to their other natural advantages, why I urge you to adopt these wonderful forcing decks in your own work." In the right hands, this effect is nothing short of a miracle. Al Koran was a brilliant mentalist and his improved version of the Bagshawe Deck was one of the features of his world renowned act. It baffled audiences for years. In this new release, Al Koran's improved design and handling has been strengthened even further - integrating contemporary performance techniques with a streamlined set-up that eliminates any potential pitfalls. The result is a Bagshawe Deck that combines maximum audience impact with an ease of performance never before possible. 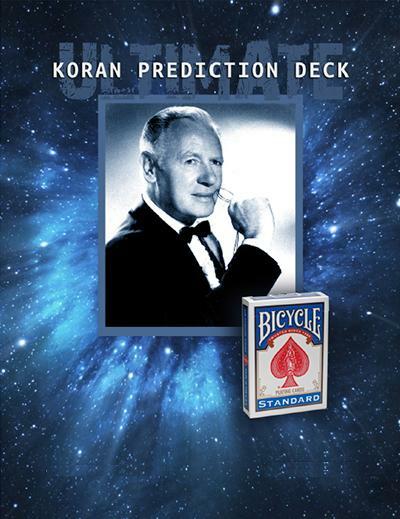 We call it the Ultimate Koran Prediction Deck (formerly the UK Bagshawe Deck). Here's the effect. A deck of cards is openly fanned in front of a spectator to show the cards are different. The spectator is given the pack to thoroughly shuffle and cut. He or she is then asked to look at the top card, memorize it, and return the cards to their case. Or, if you prefer you may fan or ribbon spread the cards to have one freely selected. A second spectator now attempts to read the first spectator's mind and name the card. After that spectator fails, you uncannily reveal the card the spectator is thinking of! Keep in mind, nothing is written down. There are no sleights, glimpses or card control to worry about. No stooges or shills. The individual cards are not gimmicked or marked in any way and there are no external gimmicks. As impossible as it seems, apart from fanning the cards at the beginning of the effect, you never need to touch or go near the deck again!